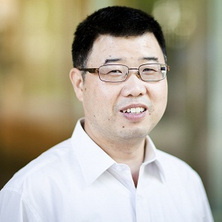 Associate Professor Zhi Ping (Gordon) Xu is an Australian Research Council (ARC) Future Fellow (2013-2016). Since 2004, He has received a number of fellowships and awards, including an ARC Australian Postdoctoral Fellowship (2005-2007), ARC Australian Research Fellowship (2008-2012), and UQ Foundation’s Research Excellence Award (2009). Associate Professor Xu and his colleagues have received funding from the ARC and National Health and Medical Research Council (NHMRC) totalling more than $5 million. Associate Professor Xu is an ARC and NHMRC referee. Clay nanomaterials for drug delivery and vaccines. Zhou, J. Z., Xu, Z. P. and Qian, G. (2013). Effective phosphate removal using Ca-based layered double hydroxide materials. In P. Lens, J. Virkutyte, V. Jegatheesan, Seung-Hyun Kim and S. Al-Abed (Ed. ), Nanotechnology for Water and Wastewater Treatment (pp. 153-168) London, UK: IWA Publishing. Jegatheesan, V., Virkutyte, J., Shu, L., Allen, J., Wang, Y., Searston, E., Xu, Z. P., Naylor, J., Pinchon, S., Teil, C., Navaratna, D. and Shon, H. K. (2012). Removal of lower molecular weight substances from water and wastewater: challenges and solutions. In D. G. Rao, R. Senthilkumar, J. Anthony Byrne and S. Feroz (Ed. ), Wastewater treatment: Advanced processes and technologies (pp. 275-318) Boca Raton, FL, United States: Taylor & Francis. Braterman, P. S., Xu, Z. P. and Yarberry, F. (2004). Layered Double Hydroxides (LDHs). In Scott M. Auerbach, Kathleen A. Carrado and Prabir K. Dutta (Ed. ), Handbook of Layered Materials (pp. 373-474) New York, N.Y. U.S.A.: Marcel Dekker. Zhang, Run, Li, Li, Sultanbawa, Yasmina and Xu, Zhi Ping (2018) X-ray fluorescence imaging of metals and metalloids in biological systems. American Journal of Nuclear Medicine and Molecular Imaging, 8 3: 169-188. Liu, S., Liu, L., Xu, Z. P., Jin, Y., Zhao, L., Wong, Y. T. and Yong, C. (2009) Comparative studies on the mechanical strength, composition and microstructure of ovine and porcine cortical xenografts. International Journal of Chemical Engineering, 2 1: 1-13. Si, Fangbo, Huang, Weiwei, Wang, Shaobin, Xu, Zhi Ping, Zhu, Zhonghua and Qiao, Shizhang (2008) Effects of calcination and composition of layered double hydroxide on phosphate adsorption. International Journal of Chemical Engineering, 1 1: 13-25. Zeng, H. C., Xu, Z. P. and Qian, M. (1999) Synthesis of hydrotalcite-like precursor compounds MgCo(II)Co(III)-HTlcs. Materials Research Society Symposium - Proceedings, 549 85-90. Wang, H., Liang, X., Thorling, C., Xu, Z. P., Crawford, D., Liu, X. and Roberts, M. (2015). A physiologically based kinetic model to characterize and predict the biological fate of circulating tumor cells in vivo. In: European Cancer Congress, Vienna, Austria, (S133-S133). 2015. Li, L., Gu, Z., Gu, W. Y., Liu, J. and Xu, Z. P. (2015). Efficient drug delivery for cancer treatment using Si02-LDH nanocomposites. In: Biotech, Biomaterials and Biomedical: TechConnect Briefs 2015. 10th Annual TechConnect World Innovation Conference and Expo, Held Jointly with the 18th Annual Nanotech Conference and Expo, and the 2015 National SBIR/STTR Conference, Washington, DC, United States, (17-20). 14-17 June 2015. Zhou, Chun-Hui, Beltramini, Jorge N., Lin, C. X., Xu, Z. P and Tanksale, A. (2011). Selective oxidation of bio-glycerol with molecular oxygen over CuAlMg hydrotalcite-based catalysts. In: 22nd North American Catalysis Society Meeting (NACS), Detroit, MI, USA, (). 5 - 10 June 2011. Musumeci, Anthony, Broadhurst, Gysell, Smith, Suzanne, Xu, Zhi P., Minchin, Rodney F. and Martin, Darren J. (2009). Radiolabeled clay nanoparticles for toxicological investigations. In: Proceedings of the 8th World Biomaterials Congress. 8th World Biomaterials Conference, Amsterdam, The Netherlands, (). 28 May 2008 - 1 June, 2008. Ogbomo, S.M., Richardson, M.C., Braterman, P.S., Xu, Z.P. and D'Souza, N.A. (2008). Polystyrene nanocomposite materials by in situ polymerization into Zn Al layer double hydroxide stearate hexadecane styrene monomer interlayer. In: 66th Annual Technical Conference of the Society of Plastics Engineers : plastics encounter at ANTEC 2008: Proceedings. 66th Annual Technical Conference of the Society of Plastics Engineers, Plastics Encounter at ANTEC 2008, Milwaukee, WI, (620-623). 4 - 8 May 2008. Jin, Y. G., Xu, Z. P., Qiao, S. Z., Diniz da Costa, J. C. and Lu, G. Q. (2007). Proton Conduction of Ordered Mesoporous Silica- Methanesulfonic Acid Hybrids. In: Proceedings of 5th International Mesostructured Materials Symposium (IMMS 2006). 5th International Mesostructured Materials Symposium (IMMS 2006), Shanghai, China, (817-820). 5-7 August, 2007. Mereddy, K. R., Xu, Z P, Diniz da Costa, J C and Lu, G (2006). Characterisation and regeneration of layered double hydroxides for high temperature CO2 separation. In: N Rokke O Bolland J Gale, 8th International Conference on Greenhouse Gas Control. 8th International Conference on Greenhouse Gas Control, Norway, (1-5). 19-23 June 2006. Ram Reddy, M. K., Xu, G.Z.P., Diniz da Costa, J. C. and Lu, M.G. (2004). Layered double hydroxides for CO2 selective separation from water-gas-shift reaction. In: 1st Nano-Engineering and Nano-Science Congress 2004. 1st Nano-Engineering and Nano-Science Congress 2004, Singapore, (1-1). 7-9 July 2004. Nanofabrication of Layered Double Hydroxide Nanoparticles with Silica for Targeting Delivery. Engineering nanohybrid platforms for oral vaccine delivery. Modifying layered double hydroxide nanoparticles with peptide to penetrate blood brain barrier for gene delivery .